LENGTH OVERALL 1 40 FT. 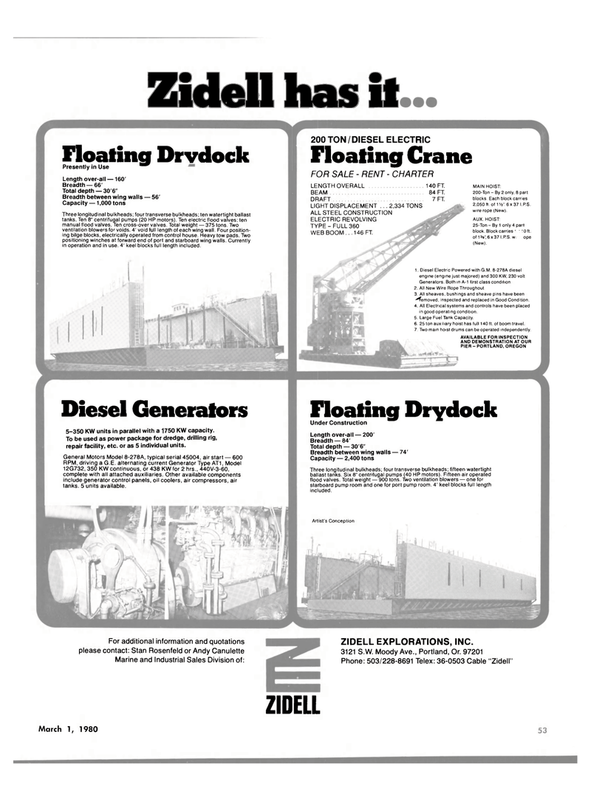 WEB BOOM . . .146 FT.
MAIN HOIST: 200-Ton - By 2 only, 8 part blocks Each block carries 2,050 ft. of 1 Vz". 6 x 37 I.P.S. wire rope (New). Generators. Both in A-1 first class condition 2. All New Wire Rope Throughout 3. All sheaves, bushings and sheave pins have been -Removed, inspected and replaced in Good Condition. 4. All Electrical systems and controls have been placed in good operating condition. 5. Large Fuel Tank Capacity. 6. 25 ton auxiliary hoist has full 140 ft. of boom travel. 7 Two main hoist drums can be operated independently. Diesel Generators 5-350 KW units in parallel with a 1750 KW capacity. To be used as power package for dredge, drilling rig, repair facility, etc. or as 5 individual units. RPM, driving a G.E. alternating current Generator Type AT1, Model 12G732, 350 KW continuous, or 438 KW for 2 hrs., 440V-3-60, complete with all attached auxiliaries. Other available components include generator control panels, oil coolers, air compressors, air tanks. 5 units available. Three longitudinal bulkheads; four transverse bulkheads; fifteen watertight ballast tanks. Six 8" centrifugal pumps (40 HP motors). Fifteen air operated flood valves. Total weight — 900 tons. Two ventilation blowers — one for starboard pump room and one for port pump room. 4' keel blocks full length included. Phone: 503/228-8691 Telex: 36-0503 Cable "Zidell"